US - The USDA’s quarterly Hogs and Pigs report contained no surprises for the trade and Lean Hogs futures reflect that fact by being quiet at mid-day on Monday. 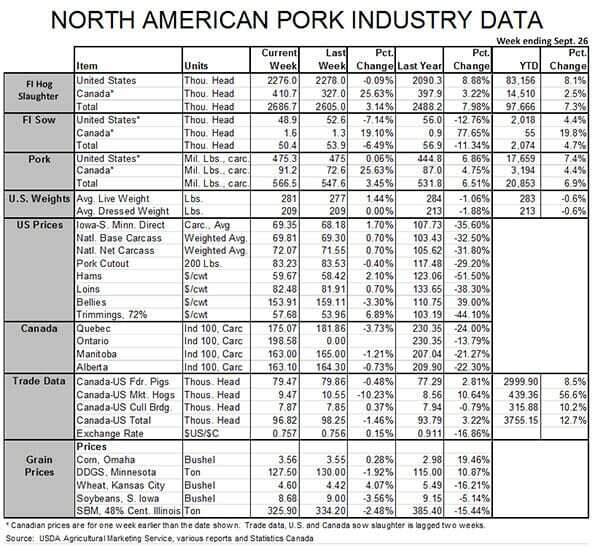 The key national data from the report appear in Figure 1, writes Steve Meyer in the National Hog Farmer. The inventories of all hogs and pigs and hogs kept for breeding – 68.395 million and 62.410 million , respectively, were both record large, breaking the previous records of late-2008. We should not be surprised by this fact since the U.S. industry has set records on a regular basis from the mid-1990s through 2008, and the only reasons we have not seen records since 2008 are ethanol-driven higher feed costs and porcine epidemic diarrhea virus. I contend we are “back to normal” in these numbers. The breeding herd of 5.986 million head was 1% larger than one year ago, continuing producers’ measured and apparently calculated response to 2014’s record prices and profits. Pork producers know that was a “one-off” situation, but they also know there is some ground to be made up and, with the lowest costs since 2007 in front of us, some money to be made. The growth rate was larger than the average of analysts’ expectations but those expectations did not jibe well at all with industry chatter that still indicates a good number of new sow units are under construction. Those units, of course, may not have hogs in them yet and thus not count in this inventory. The counter argument to “anecdotal” growth is relatively high sow slaughter since June 1. We had expected higher sow slaughter last spring and into summer as producers tried to get their age/parity distributions back into order after the disruptions of PEDV. But it has gone on longer than I had expected and, I think, that fact caused analysts’ estimates to be low. Farrowing intentions that are smaller than last year and still appear a bit low relative to the sow inventory. But unlike June, these low “percentages of one year ago” are not being caused by unusually large numbers in 2015. Intentions for the September-to-November quarter are about 1% lower than what was normal in recent years. Only time will tell whether they are too low or not. Front-end hog supplies that are still ample and much larger than one year ago. The 180+ inventory of 11.053 million appears reasonable as slaughter since Sept. 1 has been up 9.6%, almost precisely the same as the 180+ year-on-year change. The 120-179 inventory was the only number in the report that differed from the average of analysts’ estimates by more than 1%. The 13.080 million pigs in this group will move to plants from mid-October to early December and represent about 1.5% more pigs than the June report suggested for that time period. They will put a few weeks of slaughter quite close to our rated capacity level (see Figure 2) but we don’t think the constraint will exert much negative price pressure this fall. Supplies will apply pressure, but capacity itself should not be a factor. Lightweight inventories are much closer to year-ago levels and the June-to-August pig crop is only 0.6% larger, suggesting that slaughter in the first half of 2016 will be much the same as slaughter this year. Litter size was again record-large at 10.39 pigs. That figure is 2.3% larger than last year, confirming our June conclusion that the industry has returned to its 2% per year growth rate for litter size. The test of this conclusion will come this winter when PEDV may make its return to U.S. hog operations. How bad will it be with a lower proportion of immune sows in the national herd? 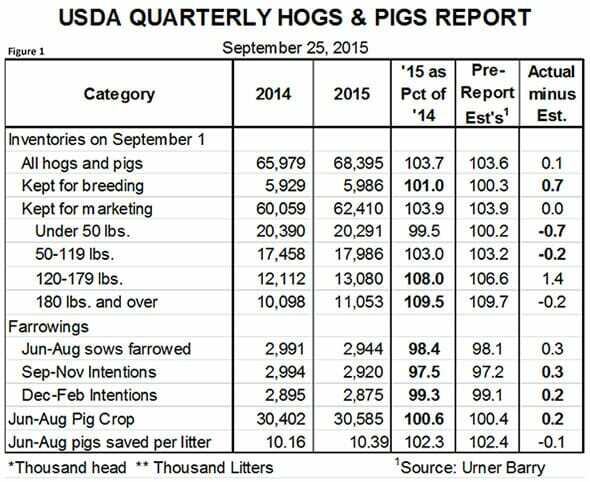 The report implies hog numbers through third quarter 2016 will be much the same as this year. 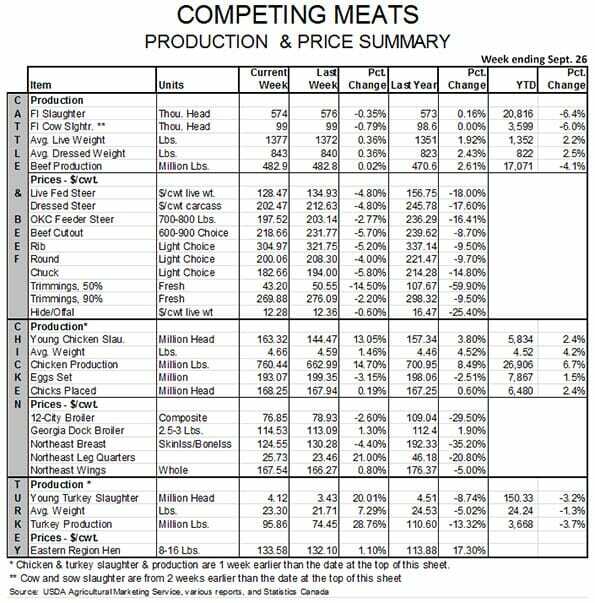 I expect weights to be lower at the beginning of 2016 but to track at much the same level as this year for the rest of the year given affordable feed ingredients and packers’ desires for and comfort with large hogs. Export demand will be better early in the year than it was this past winter due to the port slowdown. 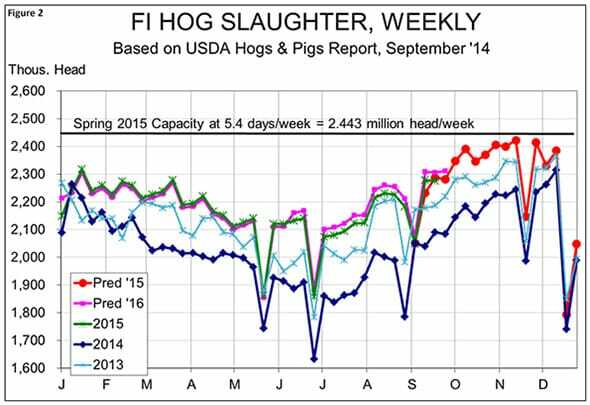 If domestic demand just holds its own, we should see hog prices in 2016 much like those of 2015. Lean Hogs futures are currently higher than that level suggesting that pricing some 2016 sales is still a good idea.